Not long after I took to twitter, posting my own tweet and commenting on others’ tweets about this month’s Birchbox, I received this tweet and was notified that BirchboxOps was now following me. I was so impressed! I had been so annoyed and disappointed with Birchbox and when they reached out to me, I felt better. If they were reaching out to me about my dissatisfaction, not only does it mean that their customer service is aware of how their customers and subscribers feel about the service but also that they must want to try and make it up to me somehow. I felt so guilty about the nasty email I had typed up to send them. I figured they were going to listen to my views on the October Birchbox, apologize for the monstrosity that was the Goop-Birchbox and maybe even try to give some sort of compensation (in the form of a bottle of essie or something.) I direct messaged them my email, as they requested, and after a few hours I received my first email from a staff member at Birchbox… It was all down hill from there. Not only did they not offer any form of compensation, their copy-and-pasted responses were so apparently generic it’s insulting. Now, I doubt that very many people will take the time to fully read the entire email conversation I’m about to share with you all nor am I naive enough to think very many people will even car. However, I have done a little copying and pasting myself and have the back and forth emails posted below. I wanted others to see a good example of how little the Birchbox Operations staff cares about the opinions of their subscribers. So little, in fact, that I was addressed by an entirely different name. If you’re at all interested, please feel free to read the back-and-forth below. 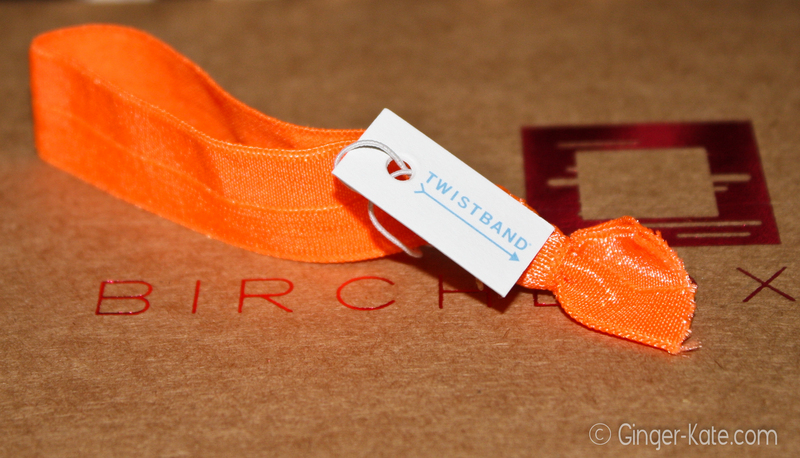 The main mission of this post is to address potential Birchbox subscribers. So, to anyone who is considering becoming a Birchbox subscriber: all I can suggest is that you look into the other subscription cosmetic sample boxes available. I’m currently a subscriber to GlossyBox and I couldn’t have been more pleased with my first box. My first box from GlossyBox had better products, larger “samples” and is most likely worth more (monetarily speaking) than all of the Birchboxes I have received combined. Another great service is Ipsy, previously MyGlam. I will be signing up for Ipsy, this week, immediately after cancelling my Birchbox subscription. I’m only waiting on my Birchbox order (the one I purchased and posted about in yesterdays post) to ship before I cancel. Anyway, here’s the email conversation between myself and the Birchbox Operations team members. I don’t hold anything against the actual ladies who had the task of reading and replying to my messages, I do, however, have a problem with Birchbox’s protocol of dealing with these matters. Clearly, a disappointed subscriber is at the very bottom of their priorities. Unfortunately, providing quality, deluxe samples isn’t at the top. Calling me by the wrong name; her name. -No explanation needed. Explaining to me their definition of “deluxe-size samples” -I’m aware and none of the samples I received this month were “deluxe” by anyone’s definition. Stating that of the products featured in the sneak peek, each subscriber would receive at least one -I didn’t receive any of the feature products. Saying they will share my input with their brand partners. -So, they will use my opinion to get bigger, better samples from their “brand partner” FOR FREE and then give them away to paying subscribers, making their subscribers happy, who will obviously want to stay a subscriber, thus, making Birchbox more money yet they can’t throw me a product or two to thank me for my imput and dissatisfaction? BS. Thanks for reading. And to those who continue reading from here, I thank you even more. PS I’d love to hear any and all opinions and comments on this matter. Please feel free to contact me directly or to share your comments below (I always respond!) -Thanks again! are quite upset as well. 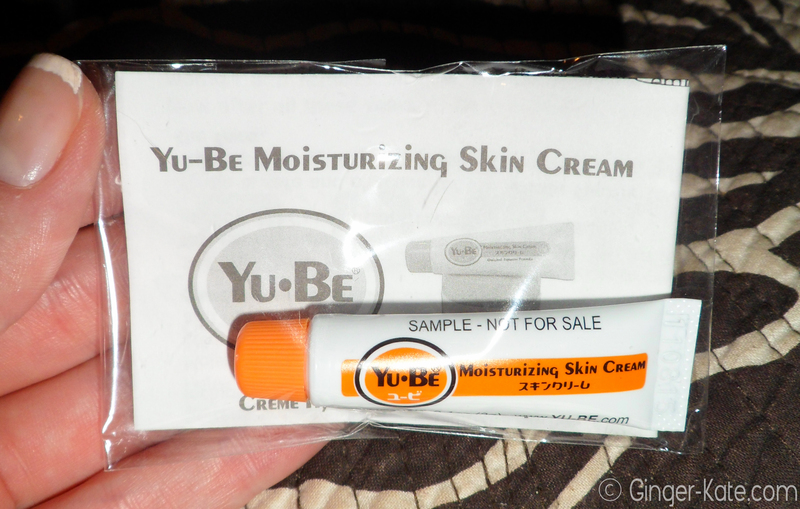 received more than a one-time use sample. bloggers leaves me impressed with their service as well. others 5 one time use samples? Its not fair and it does not make any sense. 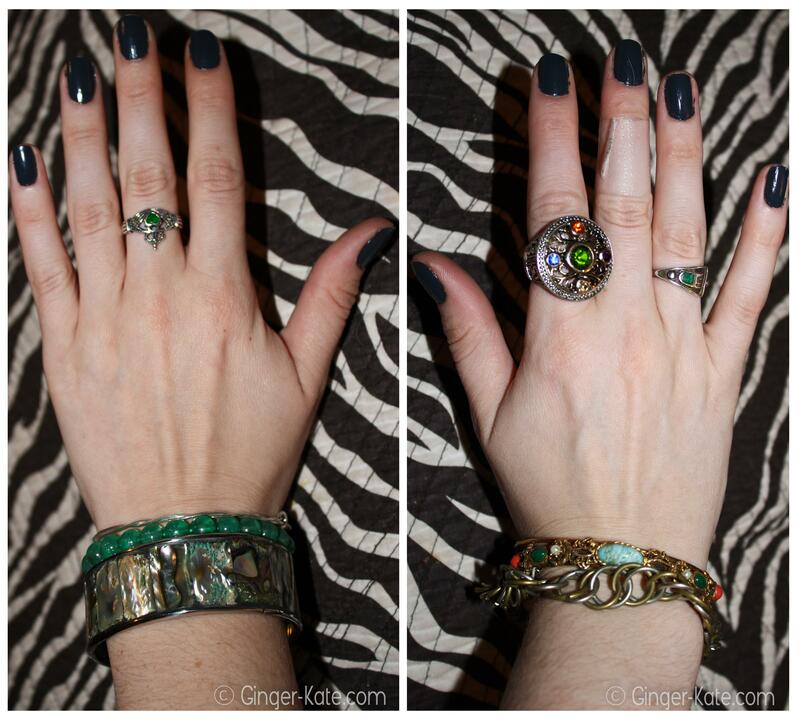 sized samples to pass on to your subscribers? beginning to look and feel like a fool for continuing. Thank you for writing in, and I am so sorry that you were not satisfied with your Birchbox delivery this month! We definitely are aware of the fact that sample impression is important, and an appropriate amount of product is the only way to make a valid decision as to whether it’s a product you would like to purchase in the future or not. While sample sizes do vary each month, it highly depends on what the brands provide us and feel is a deluxe-size sample. 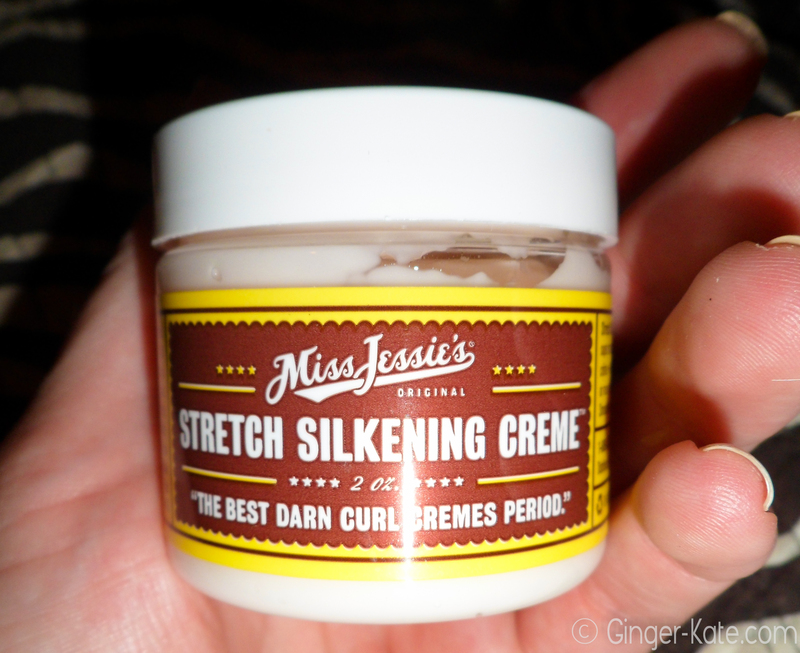 Deluxe-size means the sample gives you the opportunity to try the product on multiple occasions. Based on the brand’s opinion, the samples they produce coordinate to how much of the product they feel should be used in one use, three uses, and so on. While smaller samples are by no means the standards of what we want to send our subscribers, the product is one that we want to be able to share with our customers. We post our Favorites video each month to highlight items that our members will be receiving. 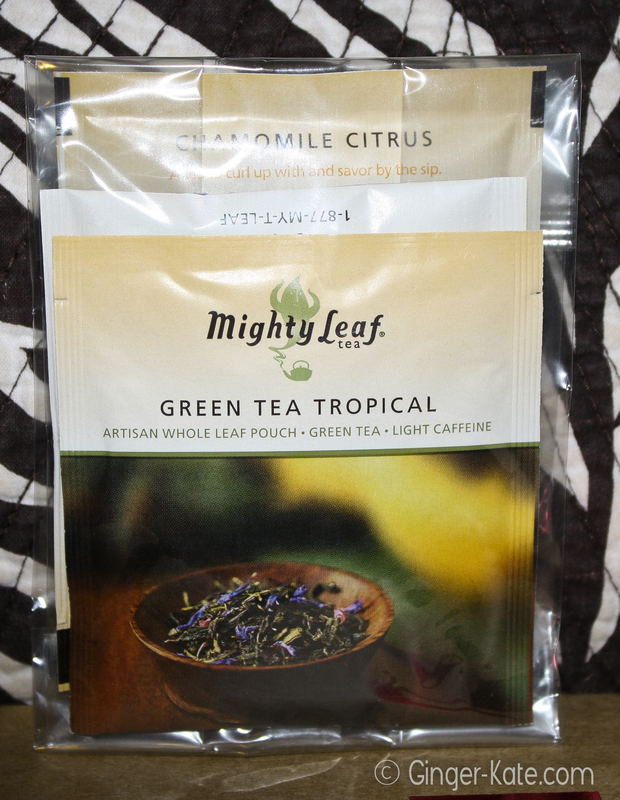 Everyone will receive at least one or two of the samples featured, but not all. They are also allotted by your Beauty Profile preferences. I recommend that you update your Beauty Profile in order to receive products more suited towards your tastes. Once again, I apologize for your disappointment and we understand your concern completely. We are constantly trying to evolve as a brand and company, for this reason, customer feedback is extremely important to us and highly encouraged! I will be sure to pass this along to our Beauty Partnership Team, so that they are aware of how this sample was received. In the meantime, if you have any other questions and/or concerns, please do not hesitate to reply to this email or give us a call at: 877.487.7272 (9am-5pmEST| M-F). MY name isn’t Anastasia. From what I can tell, YOUR name is Anastasia. Your keen observation skills and ability to address me by my own name are a perfect example of the level of care Birchbox gives to their subscribers/customers. Allow me to respond to your most recent BS: So, a small pouch of moisturizer, a pouch that can not be resealed and a small package of dry shampoo, that also can not be resealed, are considered “deluxe”, multiple-use samples according to the company that produced them and you’ll stand by that? This is absolutely laughable; you must realize this. In a box of four samples: 2 products are tear-open, one-time-use packets, 1 product is a face mask to be used ONCE and the final product is a minuscule tube of lip gloss. The lip gloss is the ONLY product that I will (reluctantly) agree can be used multiple times. 4 horrible samples and then you throw in a LUNA bar as an extra… YAY! Excuse me while I jump for joy. Thank you for your response but you really just wasted more of my time corresponding with you and gave more false hope that Birchbox would take responsibility for their service and at least attempt to make a recovery. I will be canceling my subscription following the delivery of the products I recently ordered off of your site. I will be giving my $10 a month to Ipsy/MyGlam from now on in addition to my GlossyBox subscription. I’d thank you for your service over the last 7 months but it’s been horrible.The LEAST you could do is get my name right since you’ve been billing me for more than half a year. You reached out to me as if you were willing to/looking to make this wrong a right. Clearly you just wanted another opportunity to repeat the lofty description of your “deluxe” samples. Do you have a complaint response template that you simply copy and paste in your email responses as you see fit? I am completely aware that sample sizes vary each month but a box that consists of strictly one-time-use samples IS NOT what you promise, it IS NOT what you advertise and it is certainly NOT what I signed up to pay $10 a month to receive. So sorry for the typo and your disappointment in my response. I am definitely passing your feedback along so that it will be heard by our brand partners. 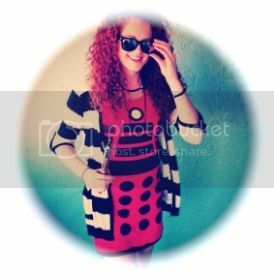 xGingerKate: Thank you for your prompt response and apology, Anastasia. And no, I will require no further assistance from Birchbox. That’s it. Nothing overly interesting or exciting. I did think that it was worth sharing though. Again, if you’re considering becoming a Birchbox subscriber, reconsider. 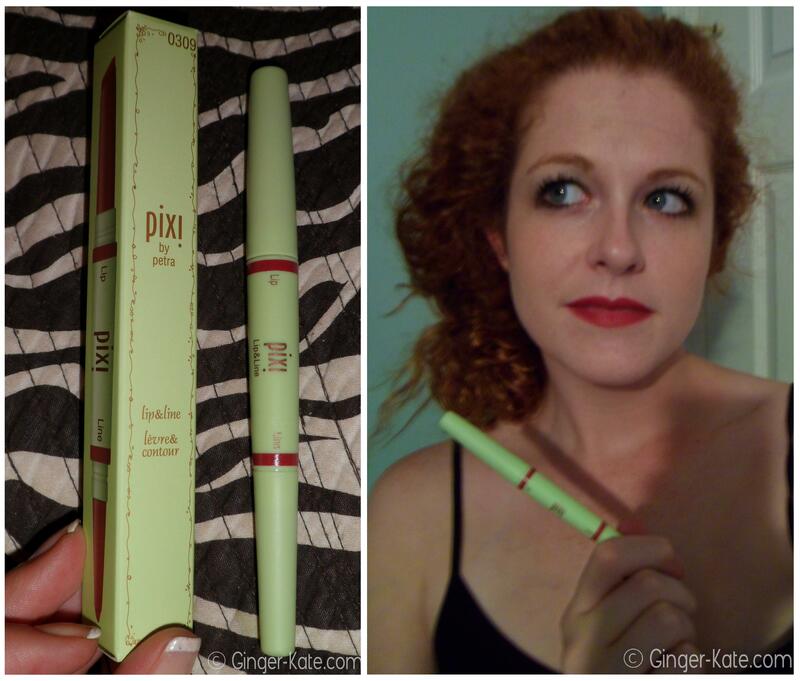 Check out other blogger’s reviews of Birchbox, GlossyBox, Ipsy/MyGlam and the other subscription sample boxes out there. Birchbox is a let-down monthly with their skimpy samples and then on top of that, they clearly don’t care very much about resolving any issues that their customers may be experiencing. If you read through that crap, it is very much appreciated. Sincerely, thank you. 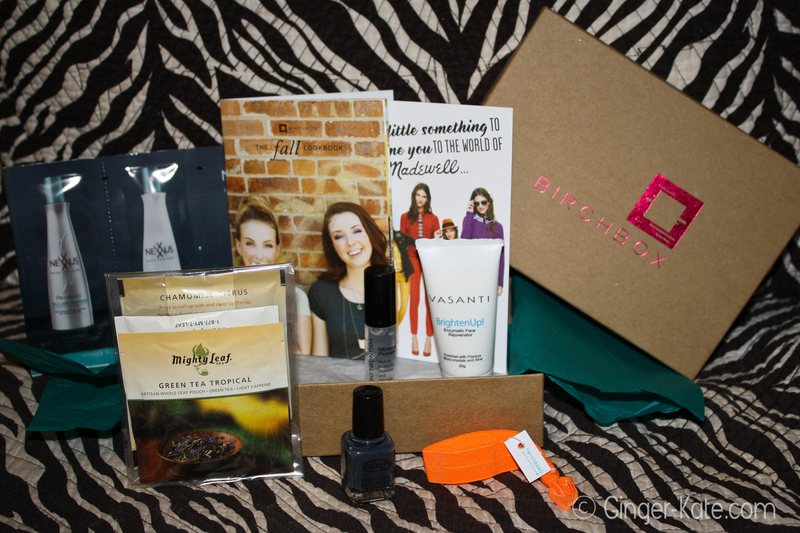 I received my October Birchbox yesterday afternoon along with my first ever GlossyBox. 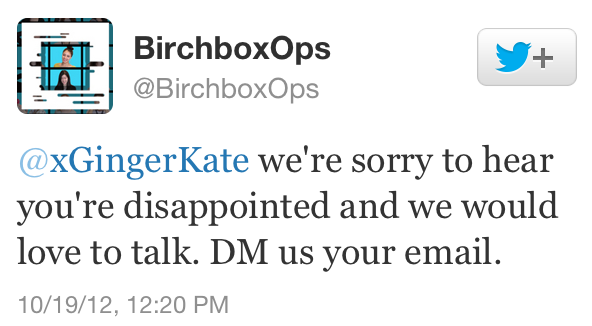 Bad timing, Birchbox. GlossyBox blew Birchbox out of the water and by far. I’ve been disappointed in the past with my monthly Birchbox but never as disappointed as I am this month. I am positively fed up with Birchbox and their craptastic samples. They promise 5 (or 4) premium samples of high-end cosmetics. Um, no. From my very first box back in May i pointed out that the samples are far from premium and this month is the perfect example. 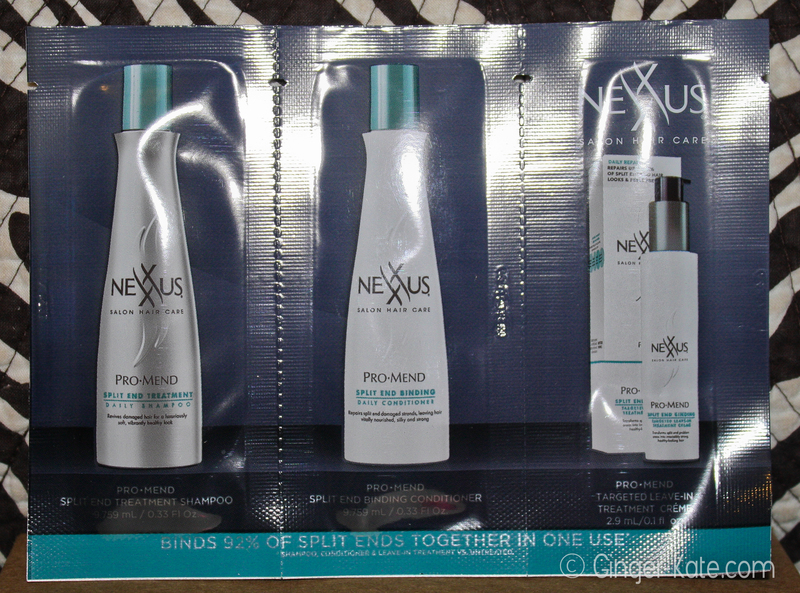 Since when are one-time use samples “premium”? I can get better walking into Macys and not have to fork over $10 a month. After pumping me full of hope and excitement over their partnership with Goop.com for the October box they sent me a box [far from] full of lame stuff. LAME, in all caps! I was really assuming that this months box would have such fabulous items inside since they were partnering with Goop.com. I was relieved because, like I have said in my monthly reviews, I’ve been disappointed with Birchbox; I figured Goop.com would provide them with amazing stuff and then they, in turn, would provide me with amazing stuff… nope. I’ve read other beauty blogger’s October box reviews and it definitely seems that me and everyone else who received the same box as me got the short end of the stick. Not even, we can’t reach the damn stick! See what I mean? What the crap, Dude? 1.) 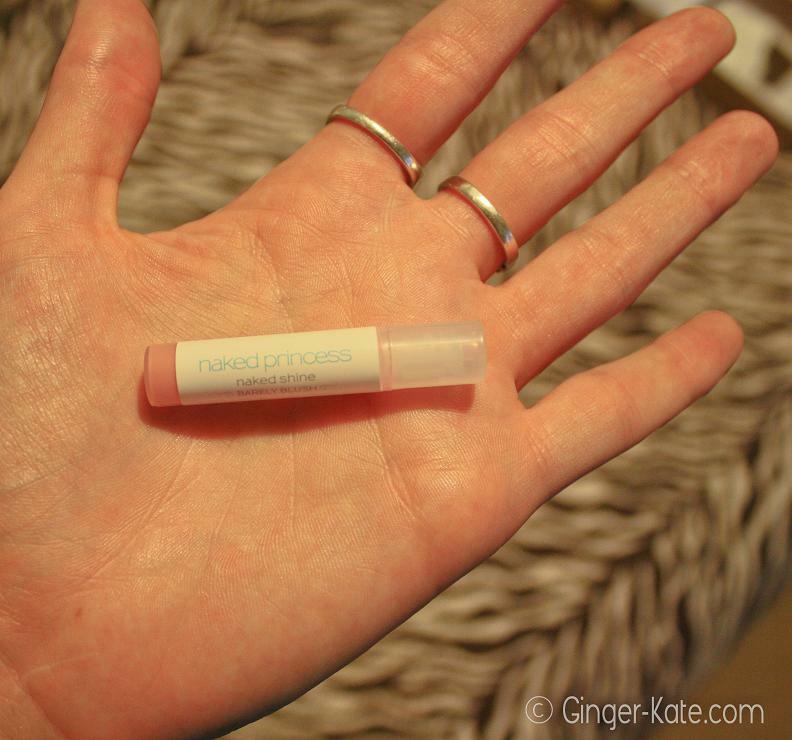 Naked Princess – Naked Shine Luscious Lip Gloss in Barely Blush :: Full Size $26 – ♥ – Lets first take a look at the miniscule sample of lip gloss from naked princess. 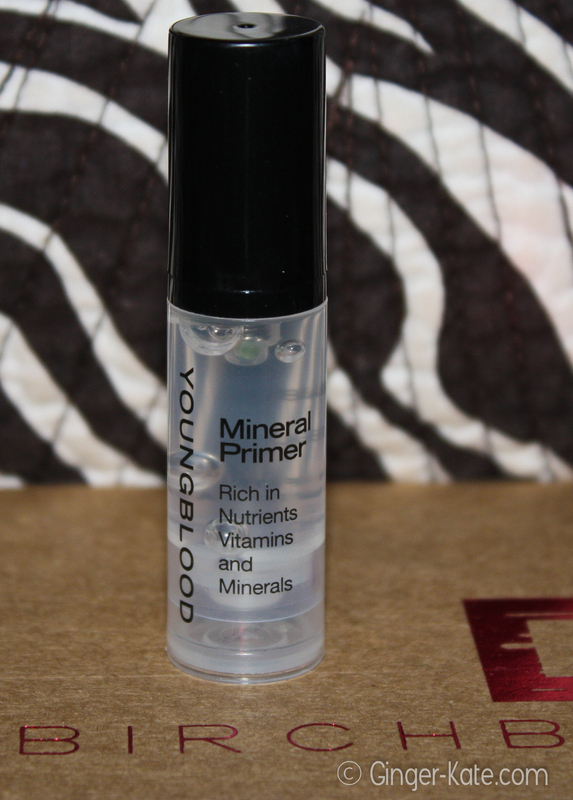 I’m a lipstick/lip gloss lover so I’ll definitely use this sample… for about 1 day. You can barely tell I’m wearing lip gloss at all as this is a “sheer gloss”. I like subtle glosses but I’m still not a fan. 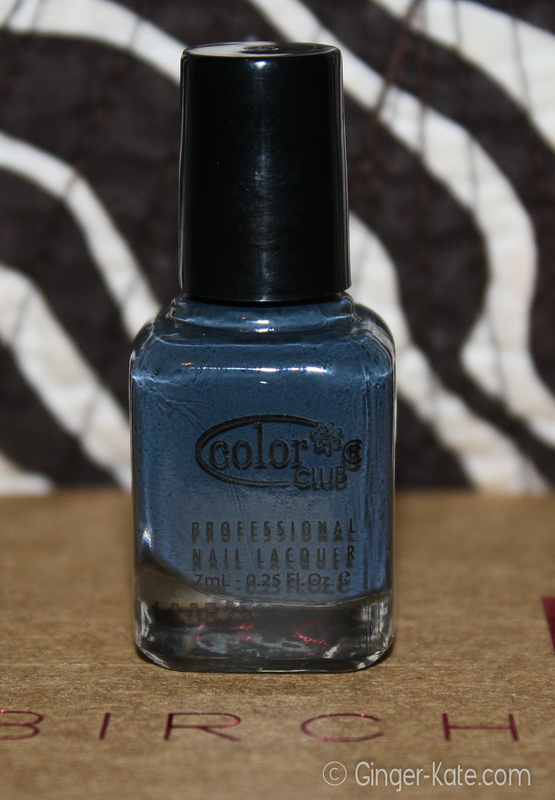 Hence, the 1♥ (and it would’ve been a zero if I didn’t love glosses so much). 2.) 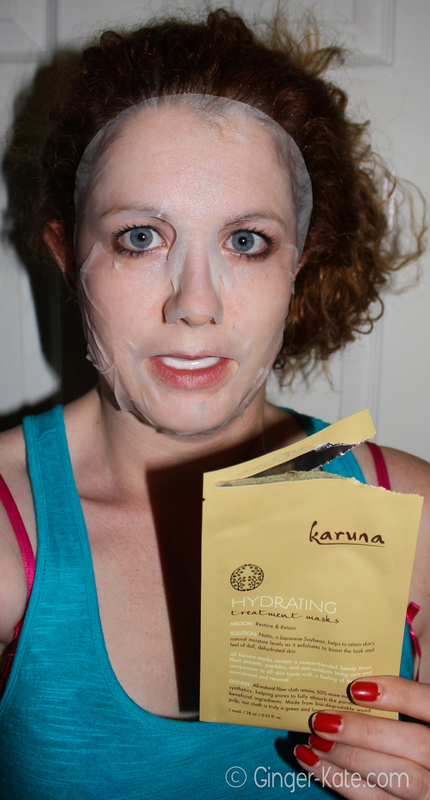 Karuna – Hydrating Treatment Mask :: 4 Masks for $28 – ♥♥ – This was definitely the most worthwhile product in the box this month. I applied my mask last night. Its not the most difficult sheet mask I’ve ever applied but it is also not the easiest. 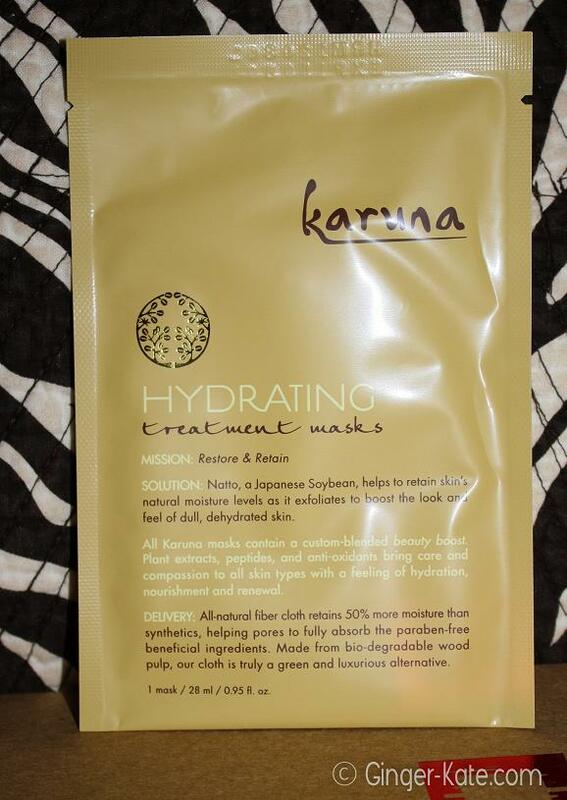 This mask is meant to provide intense moisture to the skin with it’s Japanese Natto (soybean) ingredient. I took the opportunity of applying some teeth whitening strips while I let the mask sit on my face. After removing, I blended the remaining product into my face, neck and hands as the instructions stated. It felt nice. My skin felt soft. When I woke up, my skin felt dry… es no bueno. I will not be purchasing this product in the future. 3.) 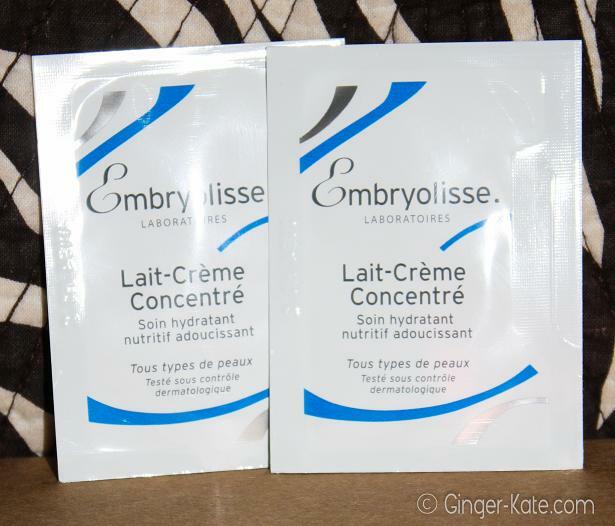 Embryolisse – Lait-Creme Concentre – 24hr Miracle Cream :: Full Size $16 – 0♥s – Since my skin was left feeling dry from the Karuna Mask from last night, I applied some of this Embryolisse miracle cream this morning, post shower/pre makeup. I don’t like. It’s also weird to me that the description boasts that this can be used a makeup primer AND makeup remover… how is that even possible? Remover I can believe since it’s so oily, but if it removes makeup, how will it help makeup to better stay on? If anyone can explain how that could be possible, please explain it to me. No sarcasm here at all. If it is possible for a product to be both a primer and later a makeup remover, I would love to understand why. Fo real-real. 4.) 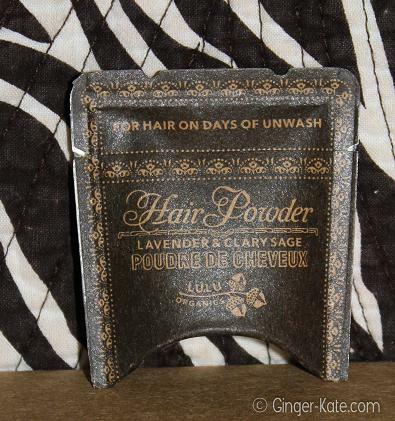 Lulu Organics – Lavender + Clary Sage Hair Powder :: Full Size $30 – 0♥s – I’m giving this sample a rating of zero ♥s even though I haven’t used it yet. I have very dry hair (which I believe was a question I answered when filling out my beauty profile but I could be wrong…) so I don’t use dry shampoos. 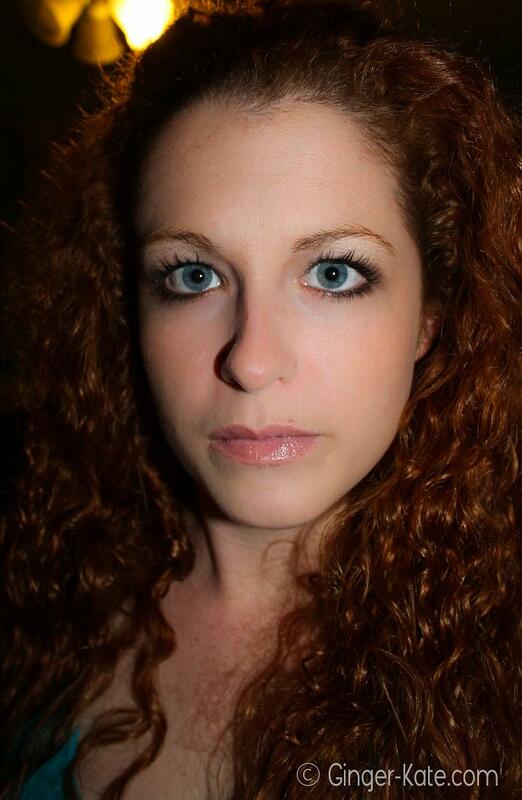 If I don’t wash my very curly, very dry hair every few days, I’ll be rocking dreadlocks. 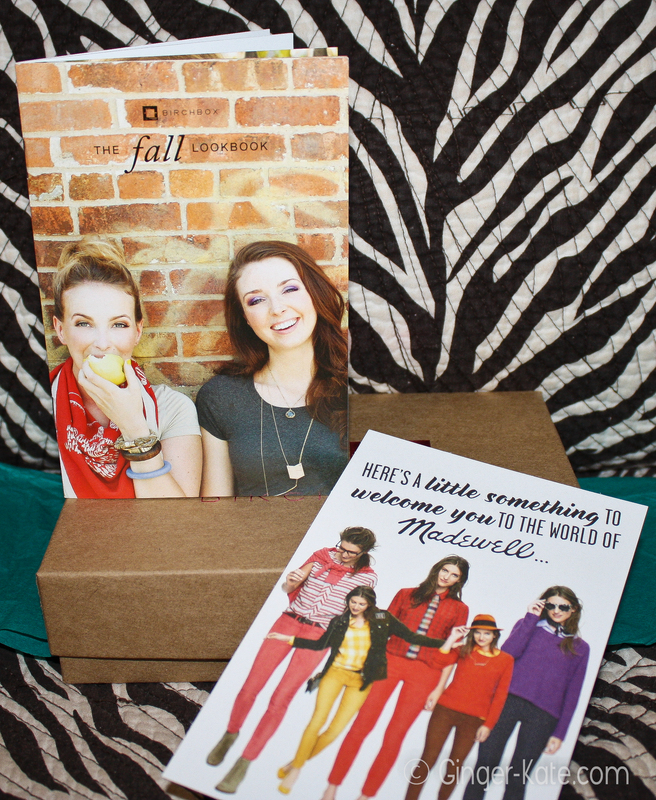 October Goop Birchbox score: 3♥s out of a possible 20♥s… and I was being quite generous. 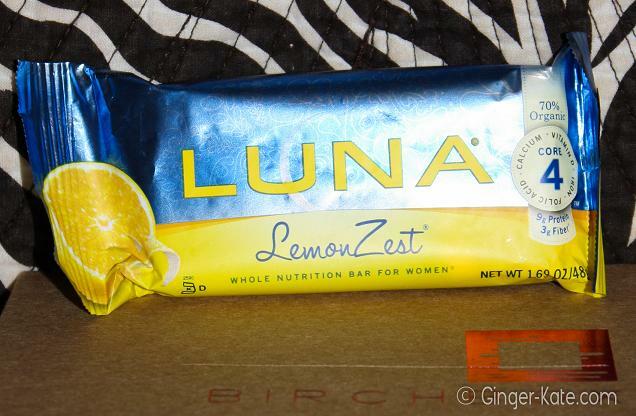 As an EXTRA, Birchbox was kind enough to provide me with a LUNA bar. (Anyone of you who have read my last couple of posts about this box will have noted the intense sarcasm.) Thanks, BB. That’s all. No, seriously, that’s it. OK, I’ve been super busy so I’m just now getting around to posting this month’s Birchbox review but here goes! The theme for August was Back To School. 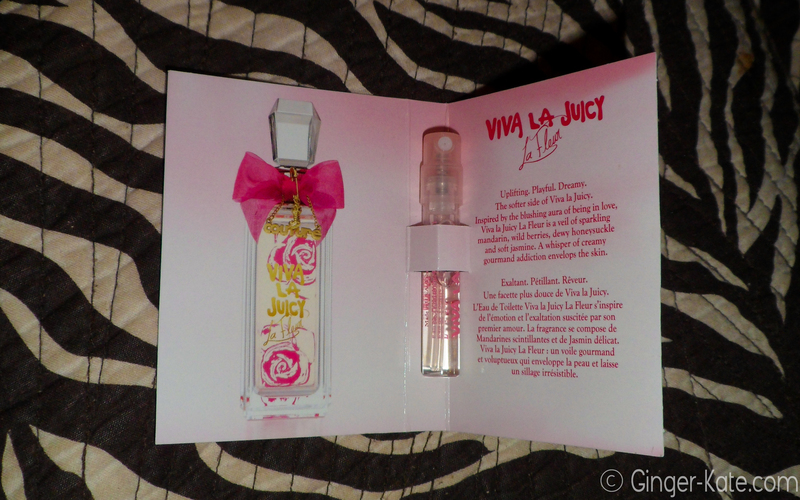 In addition to the products, the box included a fold-out full of helpful beauty and makeup tips. This box had 4 products (20 possible ♥s) and 1 extra. 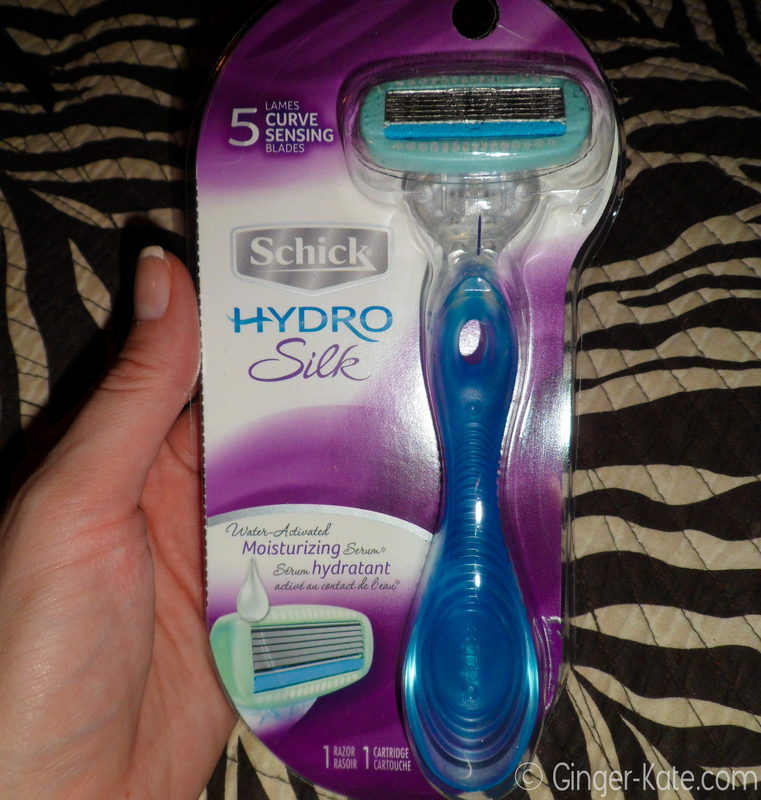 Schick Hyrdo Silk Razor – Not my brand but I’ll use it. Thanks, Birchbox! Thanks so much for reading! 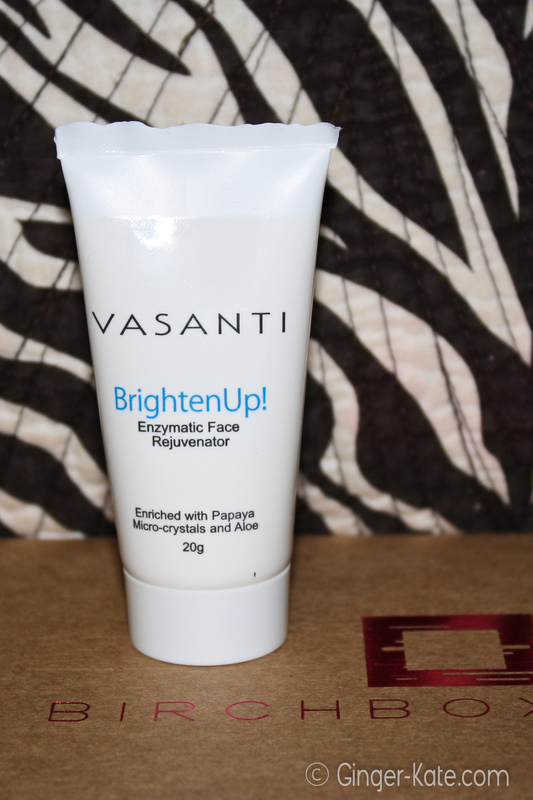 Check out my next Birchbox review!